Lock in a great price for Colinda Cabanas – rated 9.4 by recent guests! Only stayed for one night but staff was lovely and accommodation cute and affordable. A little bit out of town, which was great for us and they provided complimentary bikes to go in for dinner. 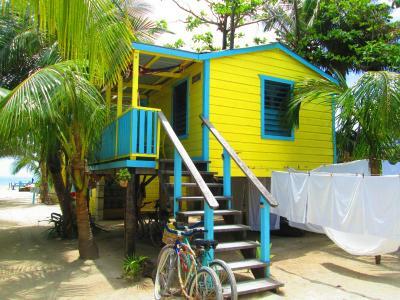 Super affordable and definitely worth staying at if you’re in Caye Caulker! The location was perfect. Within a 15 minute walk or super short bike ride to the split and around the town was extremely accessible while also having peace and solitude when we were at the cabana. 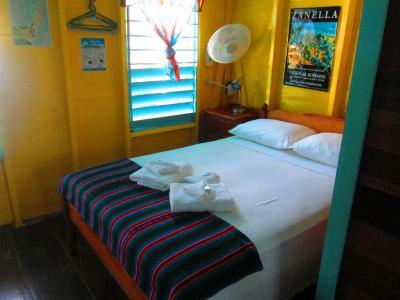 It was better than I expected, great pillows, comfy beds, staff was so helpful (called us a taxi for the morning of the departure including one to pick us up in belize city to get us to the airport), they cleaned the room every day and it was spotless. My favorite part of the entire vacation was waking up, walking down to the private dock to stretch and/or watch the sunrise then make coffee (we had coffee beans and a grinder in the cabana to brew every morning) and climb into the hammock to read for hours (with the sunshine and breeze and birds chirping all around). I don't think anyone could be disappointed with their stay here. I can honestly say that staying at colinda cabanas made my vacation for me. 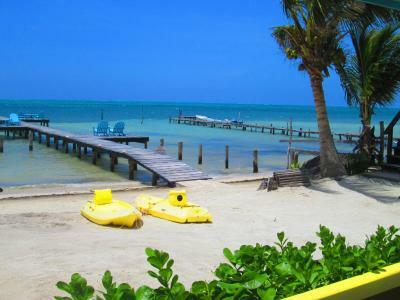 Location was great, 3 minute walk from the airport, quiet end of the island, waterfront location, great for kayaking and going slow. Beautiful setting and wonderfully friendly staff. The bikes were perfect for getting around the island as it's a little further to walk. But the location works well as it's quieter than in the heart of town. Great place to relax. It was a lovely place to stay and the people were great! Beautiful cabanas that are very clean. The on-site managers are very friendly and accommodating. Complimentary bike use was essential to our trip. Also a great dock to watch sunrise from! Free bikes and kayaks to use! Nice dock as well. Staff very helpful. 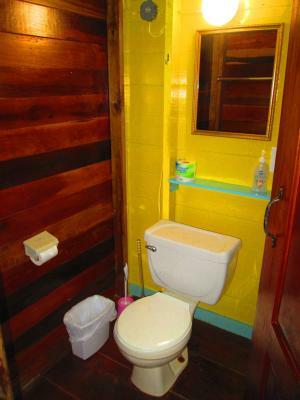 The property was spotless and very well maintained. There were a lot of amenities included that you would normally pay for at other properties such as kayaks, snorkel gear, rafts and bikes. The staff was super friendly and helpful. 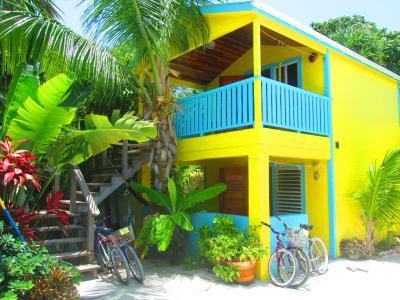 Colinda Cabanas is located on the island of Caye Caulker in Belize. 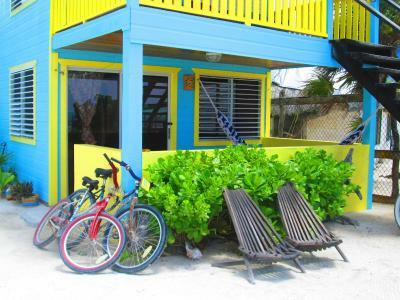 All rooms come with a safe, bottled water, bicycles, kayaks, snorkel gear and large outdoor patios. 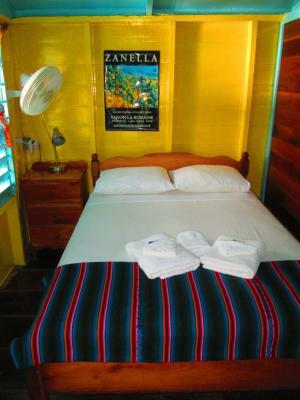 All rooms have private bathrooms which come with hot and cold purified water. Towels and bed linens are provided, as well as daily maid service. The sea-view suites and the deluxe queen rooms feature air conditioning in the bedrooms. 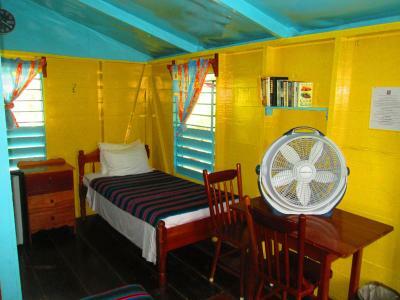 The one bedroom bungalows have several fans and a fridge; but they do not have air conditioning. 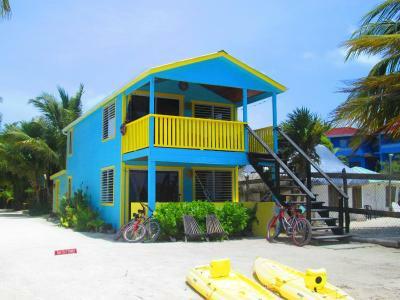 The nearest airport is the Caye Caulker Airport located 0.6 mi from Colinda Cabanas while Philip S. W. Goldson International Airport, 23 mi from Colinda Cabanas.televisions or kitchens. When would you like to stay at Colinda Cabanas? 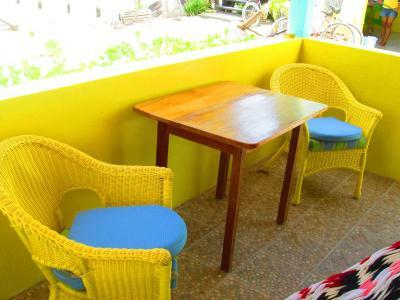 The Ocean front suites feature an outdoor balcony/dining area and an inside lounge area with a fold out futon. The bedroom has A/C. , queen sized bed and flat screen T.V. The kitchen has a stove/oven, Coffee Beans and machine, 5-gallon water, blender and refrigerator. 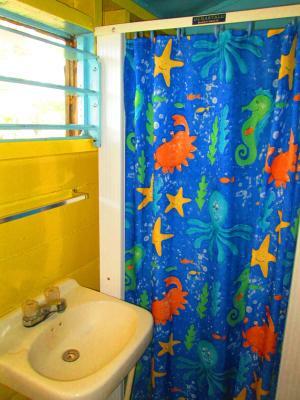 The bathroom has hot and cold purified water, a shower and free toiletries. Towels and bed linen are available. 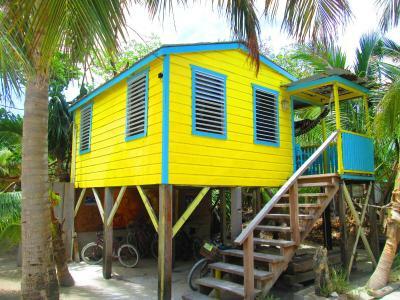 These stand-alone "Caribbean Style Cabanas" offer a large outside patio, single bed, double bed and a hammock. 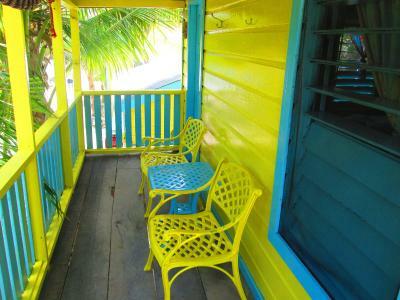 The bungalows also come with a 5-gallon purified water, basic dishes, fridge and coffee pot + beans. Several wall fans and well-screened windows. Please note they DO NOT have A/C. Please note that the "One-Bedroom Bungalows" are not located on the beach.They sit back about 300' from the waters edge. 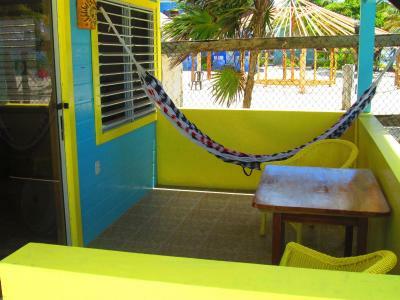 The Deluxe queen rooms feature an outdoor balcony with chairs and a hammock. These units are completely air conditioned. 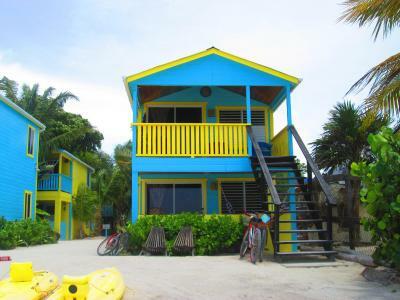 The Beach is a one minute walk away. The bedroom has a queen sized bed. 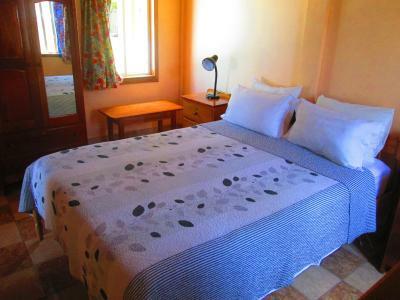 The room also comes with basic dishes, Coffee Beans + machine, 5-gallon water, blender and refrigerator. The bathroom has hot and cold purified water, a shower and free toiletries. Towels and bed linen are available. Please note that the "Deluxe Queen Rooms" are not located on the beach.They sit back about 300' from the waters edge. House Rules Colinda Cabanas takes special requests – add in the next step! One child from 5 to 12 years is charged USD 15 per stay when using existing beds. A prepayment deposit Via PayPal is required within 48 hours to secure your reservation, otherwise your booking will be canceled. The property will contact you after you book to provide any instructions. Any bookings totaling more than $600.00 require 50% advance payment by PayPal and the remaining balance due on arrival in CASH ONLY. 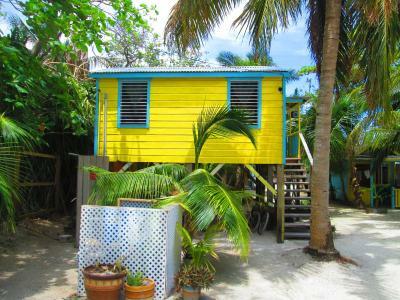 Please note the one bedroom bungalows DO NOT have air conditioning, kitchens or televisions. Please note that the "One-Bedroom Bungalows" and the "Deluxe Queen Rooms" are not located on the beach.They sit back about 300' from the waters edge. The air conditioning was very loud, but it didn't bother us too much. Great location and very friendly and helpful staff. The rooms were well equiped and the air-conditioning worked well. It was great that we were provided with bikes for free as this made it easy to get around the island. We really enjoyed our stay! Room is pretty tiny and bed is fairly hard but was perfectly fine for us for a night or two! Colinda cabanas was a dream! Beautiful setting, clean and comfortable rooms. The sunrise is the best on the island! On the quieter side of the island too - which we appreciated. But still only a 3 min bike ride to Main Street! Also the staff are the best!!!! There's a little less breeze in the units farther from the water. Not much bad to say. The seagrass was going through a thing (die-off?) and so the water close to shore wasn't that clear. I understand this is occasionally a problem all along the Caribbean coast and really has nothing to do with the hotel. Otherwise, the trip was pretty much perfect. You really couldn't ask for more! There were free bicycles, free kayaks, the room had charm and was super comfortable. There was a hotpot, microwave, hot plate, blender, plates, silverware, glasses - a pretty much fully equipped kitchen. The location was at the end of the beach but only a 7 minute or so walk to the ferry and you could walk to the split in about 15 minutes. I woke up to watch the sunrise every morning and walked over to the other side of the island for sunset every evening. The staff Juan and Emelita were so helpful and kind. I wish I was there right now. Being on the East side of th island is great too because the prevailing winds come from that direction so there is always a cool breeze. Lovely! Highly recommend a stay at Colinda Cabanas. No TV - no big deal, but sometimes nice to watch before bed / if it’s raining. shower was a little iffy - took awhile to get warm and pressure. Note - if you want A/C our room did not have it but we were just fine without it.